Chelsea propose swap deal for AC Milan midfielder? 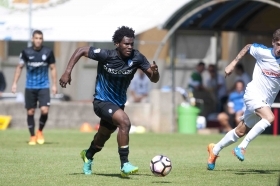 Chelsea are reportedly prepared to offer Tiemoue Bakayoko in a swap agreement to sign Franck Kessie from AC Milan in the summer transfer window. Bakayoko joined the Rossoneri on a season-long loan from Chelsea last summer with the option for the Serie A side to sign him permanently at the end of the campaign. The Frenchman has since been a vital figure for the Rossoneri in their midfield and reports have indicated that they could make an attempt to secure a permanent deal at the season close. According to The Express, the Rossoneri are not in a position to sign Bakayoko unless they are able to qualify for the Champions League group stage next term. With this in mind, the Blues are planning to propose a swap deal with the San Siro outfit whereby they would offer Bakayoko permanently in exchange for Kessie. Milan are currently sixth in the Serie A standings with 36 points but they could return to the fourth position, should they win their game in hand over Cagliari this evening.